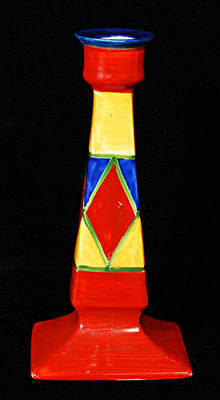 Candlestick by Clarice Cliff in the Original Bizarre pattern. Paintwork is very good. No chips or cracks. Possible slight area of retouch under the sconce condition. Size is 8 inches tall. Marked underneath “Handpainted Newport pottery England”. An early piece from about 1929. Price £265.